Great vision, great comfort and quipped with an Anti-Fog lens, Bolle's Freeze will be your best companion all day long. 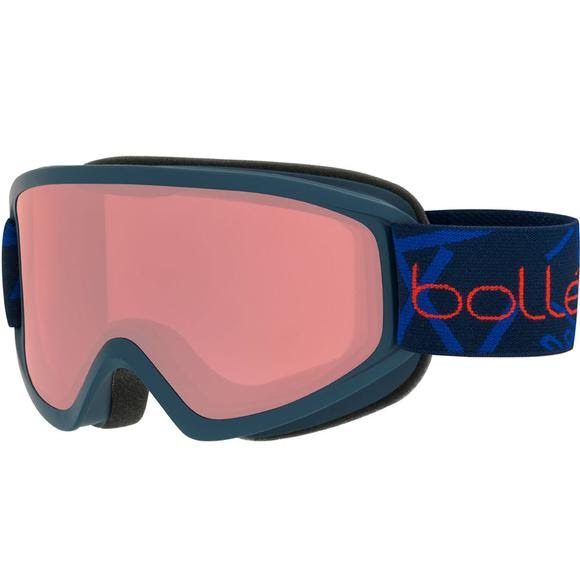 Great vision, great comfort and quipped with an Anti-Fog lens, Bolle &apos;s Freeze will be your best companion all day long. Creation of a dual-pane thermal barrier between the cold dry outside air and the moisture generated by intense activity prevents distracting condensation from forming. All Bolle® lenses block harmful UVA/UVB rays up to 400 nanometers. Engineered venting system in each frame promotes directional airflow across the inside surface of the lens, reducing the potential for moisture build up and maintaining your pristine vision. No fogging on your eyewear under any circumstance. Not only repels the fog that clouds your vision but is simply revived by an application of moisture. Available on all Bolle® Polarized 8 base models. Pink lens, brings out contrasts and maximises colour definition. A pleasure to wear in cloudy and fairly sunny conditions. Clear lens, protects the eyes against wind. Ideal for night skiing or foggy conditions.